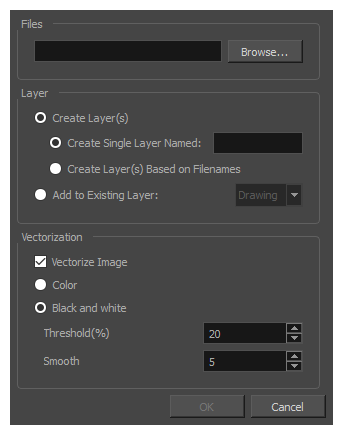 By default, Harmony works with vector images created within its own interface. Vector images are primarily composed of information about the different shapes composing the images, as well as their line and fill colours. This makes them easy to edit and paint, and allows us to resize them without affecting the image quality. In contrast, bitmap images are composed of colour information about each individual pixel composing the image. Hence, they are more fit for very detailed or realistic pictures, but they cannot be scaled without losing image quality. ‣ Colour: Imports bitmaps as vector objects with their image as a bitmap texture. The resulting drawing can be drawn or erased over, but not repainted or tweaked.